TAP, Time for Academic Progress, is an after-school academic support program funded by the B-CC High School Educational Foundation and staffed by B-CC teachers. It is offered during the school year from 2:15pm to 3:15pm each Tuesday, Wednesday, and Thursday in the cafeteria at B-CC, with easy access to the adjacent Cyber Café. Six to seven teachers are at each TAP session, with a total of twelve staffing the program. Students, in all grades and from on-level classes to the most advanced classes in English, Math, Science, and Social Studies, can drop in at TAP to get help with their course work: for an answer to a particular question, or to review course material, gain a better understanding of a specific concept, get help with homework or feedback on a paper, or review and prepare for tests. Coaches of sports teams utilize TAP by holding their team study hall in the cafeteria so team members can get the help they need in specific subjects. Staff members also may refer students to TAP and check their attendance through the school’s online system. Since the school year 2015-16, students who want feedback on a paper can save their drafts in a TAP “hand-in” folder on the school’s network during the school day. TAP English teachers comment on the drafts electronically, so students can get help without needing to be physically present. Attendance at TAP has been averaging more than a thousand visits per year for the past several years. It is a valuable resource to B-CC students and their families. In order to continue to underwrite this and other components in our Campaign for Academic Excellence, the Foundation needs your help. Donate now and help us help ALL the students at B-CC! 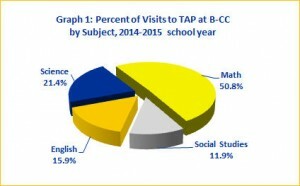 During the 2017-18 school year, more than a quarter of B-CC students made visits to TAP to get help from B-CC teachers with their school work. 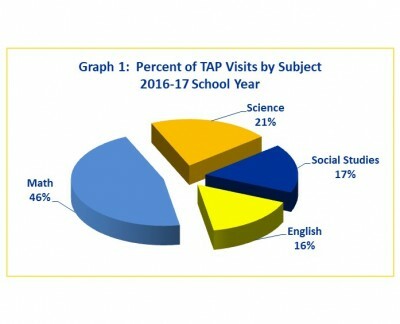 Data collected during the year showed that 525 students made over 1,900 visits to TAP, and 250 of these students indicated that they also received help in a second subject. Of the more than 1,900 visits this past year, 42% were by White students and 56% were made by Black, Hispanic, Asian, and Multi-racial students. Students in the FARMS program accounted for 18% of the visits. As in past years, Math accounted for most of the visits (42%). Science and English each accounted for 10%, followed by Social Studies at 8%. The remaining visits were made by students seeking help with college essays, languages, and general homework. Students in all grade levels made visits to TAP. Tenth and eleventh graders were the primary users: each accounted for 35% of the visits. Ninth graders accounted for 18% of the visits, and 12th graders accounted for the remaining 12%. TAP serves students at all achievement levels. 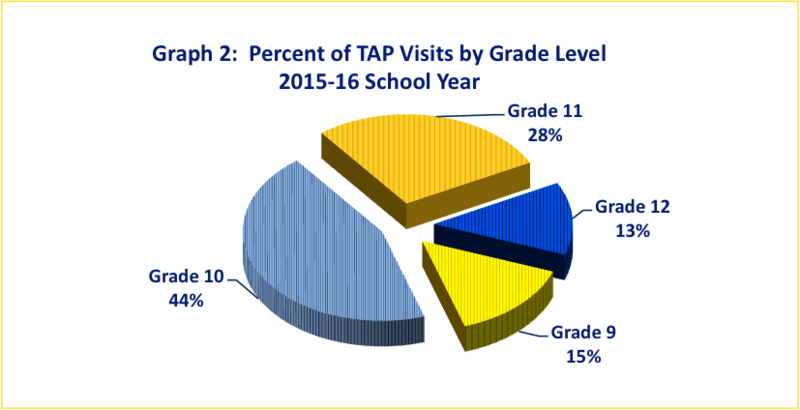 In the 2017-18 school year, 70% of the visits to TAP were by students who had 3.0 or higher grade point average, and 10% of the visits were by students with below 2.5 grade point averages. At the same time, students who were academic-ineligible during one or more quarters of the school year, regardless of their overall grade point averages, accounted for 23% of the visits. 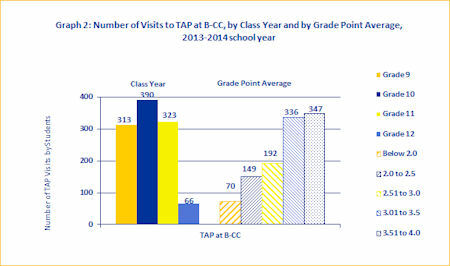 Visits to TAP was slightly below last year’s record-setting number. Because no record was kept during the few weeks when Ms. Farrar was on leave, the recorded 1,274 visits under-counted the number of visits made during the 2016-17 school year. Math continued to account for most of the visits (46%), followed by Science (21%), Social Studies (17%), and English (16%) (see Graph 1). Most (88%) of the Math visits were to seek help in Precalculus, Honors Precalculus, and Algebra. Most (52%) of the science visits were for Chemistry (28%) and Honors Chemistry (24%), followed by Physics (20%). 10th and 11th graders made most of the visits, accounting for 38% and 42% respectively (see Graph 2). 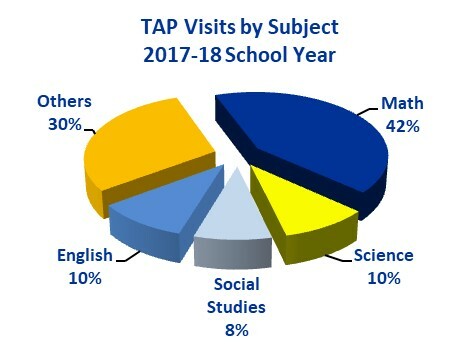 During the 2015-16 school year, students made 1,948 visits to TAP for help in English, math, science and social studies, compared to 1,189 visits in the 2014-15 school year. Math continued to have the most visits (49%), followed by Science (19%), Social Studies (17%), and English (15%) (see Graph 1). Over 60% of the total visits were in 6 courses – AP NSL Government, Algebra 2, Geometry, AP Calculus AB and BC, Chemistry, and Physics. 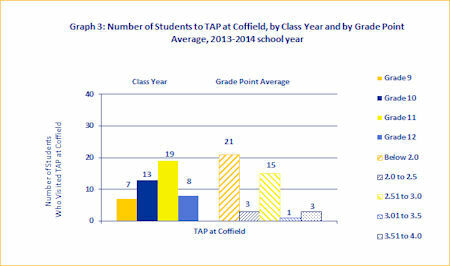 Students at all grade levels and with grade point averages ranging from below 2.0 to above 3.5 all sought help at TAP. 10th graders accounted for most of the visits (45%), followed by 11th graders (28%), 9th graders (15%), and 12th graders (13%) (see Graph 2). TAP visits were also associated with grade point averages. 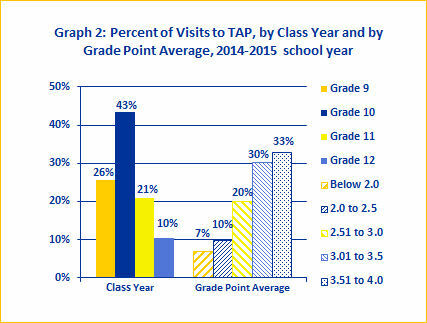 More TAP visits were accounted for by students with higher grade point averages than those with lower grade point averages during the 2015-16 school year. 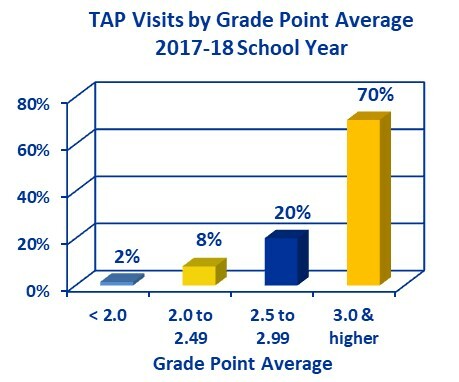 Overall, four times more visits to TAP were made by students with grade point averages 3.0 and above than by students with grade point averages 2.5 and below. Subject by subject, those with above 3.5 grade point averages accounted for most of the visits in all four subjects, while those with grade point averages 2.5 and below accounted for the least number of visits (see Graph 3). 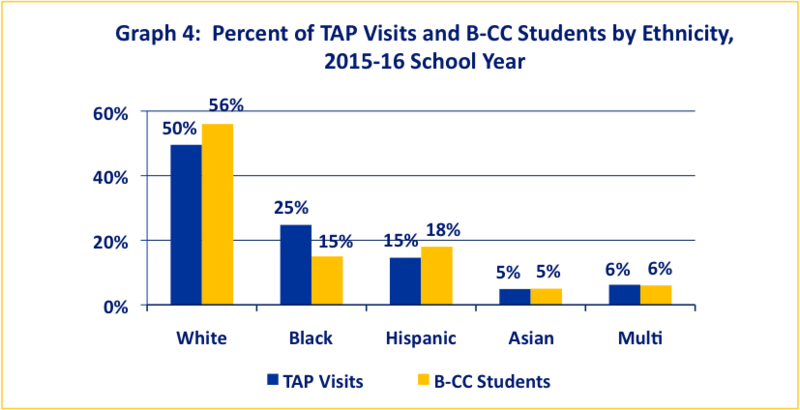 TAP visits by race/ethnicity roughly mirrors the race/ethnicity of the student population at B-CC: White — 49% vs 56%; Black — 25% vs 15%; Hispanic — 15% vs 18%; Asian — 5% vs 5%; and multi-ethnic — 6% vs 6% (see Graph 4). ESOL students accounted for 6% of the visits to TAP and students who qualified for free and reduced meals accounted for 16% of the visits to TAP in the 2015-16 school year. TAP continued to be offered at B-CC from 2:15pm-3:15pm on Tuesday, Wednesday, and Thursday each week in the 2014-15 school year. Its off-site location at the Gwendolyn Coffield Community Center in Silver Spring on Tuesdays and Thursdays had to be discontinued this school year while awaiting needed upgrades at the facility. Based on recommendations from the teachers, TAP at B-CC was revamped this school year. 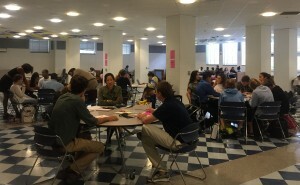 Rather than spread out in different classrooms, all TAP sessions were held in the cafeteria to make it easier for students to find their sessions and to get help with several subjects if they need it. Students also had easier access to the Cyber Café adjacent to the cafeteria. The changes worked well. 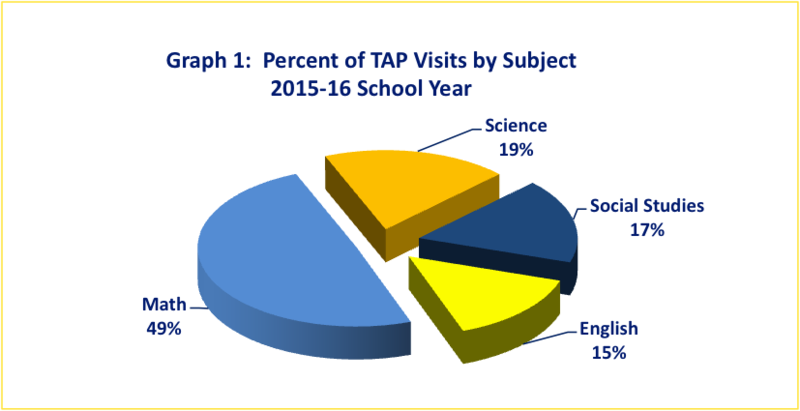 During the 2014-15 school year, 443 students made 1,189 visits to TAP for help in English, math, science, and social studies. Math remained the most sought after, with slightly more than half (50.8%) of the visits, followed by Science (21.4%), English (15.9%), and Social Studies (11.9%) (see Graph 1). TAP attendees’ ethnic make-up roughly mirrors that of the student population at B-CC: 51% white, 28% black, 13% Hispanic, and 8% Asian (see Graph 3). TAP attendance by ESOL students and students who qualified for free and reduced meals increased significantly from the previous school year: 320 ESOL/former ESOL students and 207 FARMS students in the 2014-15 school year, compared to 23 and 166, respectively, in the 2013-14 school year. During the 2013-2014 school year, TAP was offered from 2:15pm to 3:15pm on Tuesday, Wednesday, and Thursday each week at B-CC, and from 3:30pm to 5:30pm two days a week at the Gwendolyn Coffield Community Center in Silver Spring. FY2014 expenditure on TAP totaled $36,671. 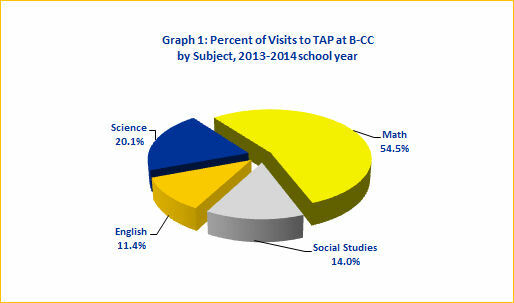 TAP at B-CC offered sessions on math and science three days a week, and English and social studies two days a week. B-CC math, science, English, and social studies teachers shared the staffing of these sessions. Stacy Farrar, TAP coordinator, monitored attendance and determined appropriate staffing. Prior to significant tests, additional staff and classrooms were made available to accommodate larger numbers of students. TAP at Coffield offered another venue for students whose work or family responsibilities made it difficult for them to stay after school for TAP at B-CC. During the 2013-2014 school year, two B-CC teachers staffed these sessions and provided help in many subjects. Additionally, while only 15% of the visits to TAP at B-CC were by students in the free and reduced-price meals (FARM) program, 73% of the students who visited TAP at Coffield were in the FARM program. During the 2012-2013 school year, math and science were offered three days a week and English and upper level math two days a week at TAP at B-CC. Four math teachers, two English teachers and two science teachers share the staffing of these sessions. A TAP coordinator is in place to monitor attendance and determine appropriate staffing. Prior to significant tests, additional staff and classrooms are made available to assist larger numbers of students. At TAP at Coffield, two B-CC teachers staffed these sessions and provided help in many subjects. Having academic support throughout the school year is a major contributor to high academic achievement at B-CC. TAP at B-CC provides the assurance to the students that help is available, as they work on mastering on-level material and as they stretch themselves and try more advanced classes. Disaggregated data by class year and by grade point average show that TAP is indeed used by all students at all level. 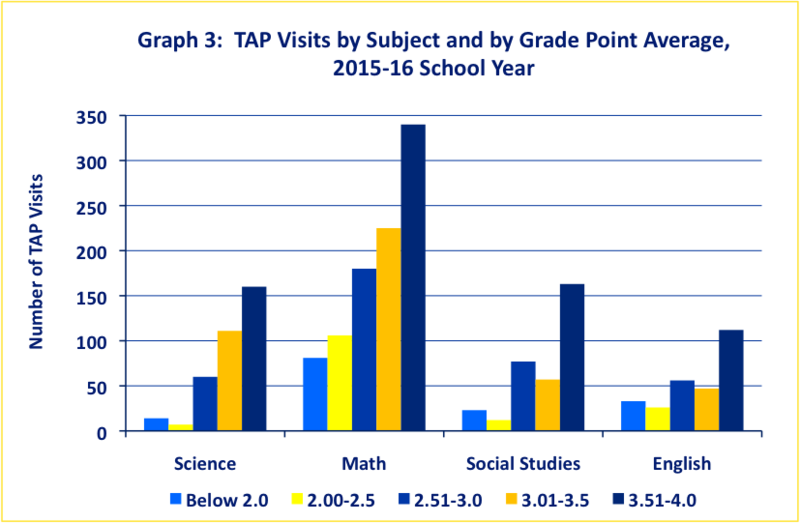 Students from grades 9 to 12 and students with grade point averages ranging from below 2.0 to above 3.5 all sought help at TAP during this past school year. In the spring of 2009, the Foundation undertook a small study to assess student use and opinion of the TAP program. The first thing we learned was that 99% of students surveyed have heard of TAP and that 90% of those who attend find it helpful. We explored why students do and don’t come to TAP. The charts below provide the responses from two separate surveys, one of TAP participants and one of students in the general population. The results from the first survey indicate that students use TAP as intended: they go to TAP for extra help with course material, particularly before a test, but also in normal homework and class assignments. The results from the second survey support the need for an evening TAP as provided at the Coffield Center. In addition to the positive feedback we received, we also learned that there are some issues that deserve our attention. First and foremost is a problem of overcrowding on the days before math tests. Forty-five respondents commented that they had not received the help they needed because there were too many students in the class. Overcrowding does not appear to be a deterrent to attending TAP (only 7% of students reported that they had not returned to TAP because it was too crowded). An additional section of Math TAP put in place this school year should reduce the overcrowding. The second most frequent comment was a request for foreign language TAP. Ten percent of respondents wrote they would like foreign language TAP. Fifty percent of these students mentioned Spanish in particular. 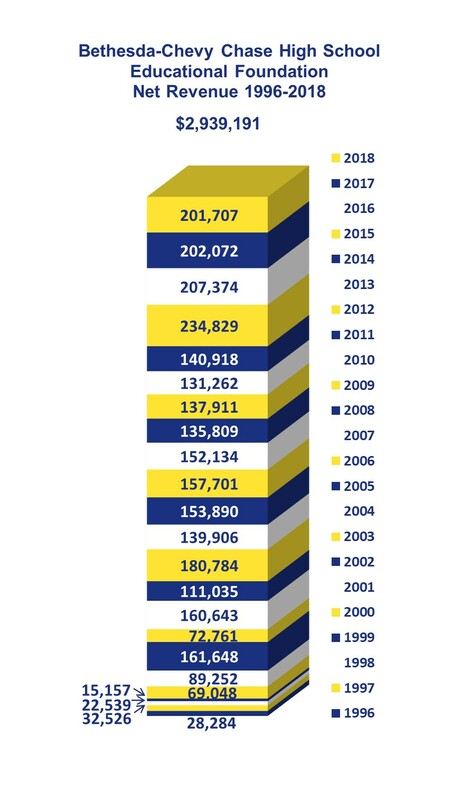 B-CC historically provided TAP for foreign languages; however that was stopped in 2007 when it could not find the resources needed to serve all six languages that are offered at the school. The Foundation will add foreign language support to its agenda this year. Finally, the surveys, along with staff interviews, confirmed that TAP is a helpful resource for participants who are having occasional difficulties with mainstream classes. TAP is less useful for students who are facing more significant or ongoing academic challenges. The B-CC HS Educational Foundation is committed to facilitating the success of every B-CC student. As such, the Foundation will continue to explore ways to ensure that all B-CC students receive the academic support they need to achieve their highest potential. In 2003, B-CC’s math department submitted a grant request to the B-CC High School Educational Foundation to fund an after-school program to provide support for math students. The Foundation agreed to fund $2,000 that fall to initiate the program called TAP (Time for Academic Progress). After positive results that first semester, the Foundation renewed the grant in the Spring 2004. Data collected by the after-school math support program indicated a 15% overall improvement in test scores among students who used the program that year. At the start of the 2004-2005 school year, in a meeting with then interim principal Sean Bulson, B-CC student leaders listed the student body’s number one priority (among academics, technology, sports, the arts, extracurricular activities, and others) as having extra time and more focused support to succeed in their academic courses. The need existed at all levels. As students stretched themselves, they often needed extra time and one-on-one attention from teachers that were very hard to provide during the regular class periods. According to the students, if they had that extra help, more of them would try advanced courses and more of them would succeed. To help these students, and those who were struggling to pass grade-level courses, the Foundation launched a special fundraising effort to expand academic support and mentoring for all B-CC students. In the fall of 2004, with an $18,500 grants from the Foundation, TAP expanded from covering just math to include English, Foreign Language, Science, and Social Studies. These TAP sessions were staffed by B-CC teachers and were open to students at all levels. Since then, the program has become a mainstay of academic support programs at B-CC, and commands an increasingly significant part of the Foundation’s annual budget. The TAP program at the Gwendolyn Coffield Community Center began during the spring semester of the 2005–2006 school year as an extension of TAP at B-CC to offer another venue for B-CC students to receive academic support. The location is more convenient for students who live in the Rosemary Hills area, and the later-afternoon hours make it more convenient for students whose work or family responsibilities make it difficult for them to stay after school for TAP at B-CC. TAP at Coffield serves a much smaller but needier group of students who benefit from the structure and small group support in getting their work done. B-CC teachers staff these sessions and students get help with academic subjects and study strategies, and learn good study habits and routines which help them throughout high school. Funding for the Coffield site began with a start-up grant of $12,000. This amount has remained relatively consistent over the years. Up till 2011, the Coffield site had its own program coordinator. However, starting with the 2011-2012 school year, to tighten coordination between the B-CC and Coffield sites, there was one program coordinator for both sites. The Coffield site for TAP has been been discontinued since the fall of 2014 because of needed upgrades at the Coffield Center. The Foundation has been funding relatively small grant requests since its inception. TAP began as one of those small requests that started with the desire to provide assistance to struggling math students. Now, more than a decade later, most students at B-CC can say that, during their high school years, they have benefited from TAP.